As Dr. Robert Letham points out in the Introduction to his new book on the Lord’s Supper, one of the most striking differences between the Reformation era and our own day is our modern neglect of the Lord’s Supper. This doctrine, which was the single most discussed theological topic during the sixteenth century, is virtually ignored today. One may easily find numerous volumes debating various aspects of baptism, but there are very few good modern works on the sacrament of the Lord’s Supper. Letham’s small work is a good step in the right direction toward the resolution of this unfortunate state of affairs. We are provided a hint of Letham’s understanding of the sacrament in the Introduction where he mentions the famous nineteenth century sacramental debate between John Williamson Nevin and Charles Hodge. By the nineteenth century, the Reformed Church as a whole had moved quite a distance away from the Eucharistic doctrine of John Calvin. In 1846, Nevin wrote The Mystical Presence: A Vindication of the Reformed or Calvinistic Doctrine of the Holy Eucharist in an attempt to call the Reformed church back to the doctrine of Calvin. In 1848, Hodge wrote a lengthy critical review in The Biblical Repertory and Princeton Review strongly criticizing Nevin’s defense of Calvin’s doctrine. Hodge considered Calvin’s doctrine of the Lord’s Supper to be a peculiar foreign element in his theology that should be discarded. In 1850, Nevin published a 128-page response to Hodge in the Mercersburg Review. Nothing more was heard from Princeton on the subject after this. It is clear that Letham is sympathetic to Nevin’s position. He writes, “The verdict of history has been that Nevin was right and that Hodge had failed to grasp his own theological tradition” (p. 2). Letham is clearly on the side of Calvin (and Nevin) as opposed to that of Hodge. In Part One, Letham discusses several important biblical passages and issues related to the doctrine of the Supper. In his examination of the relationship between the Supper and the Passover, Letham takes the position that the point of contact with the Passover was the Cross, not the Supper. He appeals primarily to John 18:28, which speaks of the Passover in the future tense on the day following the Last Supper. After briefly outlining some of the primary scriptural terms used to describe the sacrament, Letham explains that three main things happen in the Eucharist. First, it is a memorial. Second, it is a proclamation of the Gospel. And third, it is a communion or participation in the body and blood of the Lord. In order to explain the meaning of this third aspect of the Eucharist, Letham includes an exposition of John 6:47-58. In this exposition, his indebtedness to Calvin is clear because like Calvin, he rejects the view of those who say this text has no relationship to the Lord’s Supper. 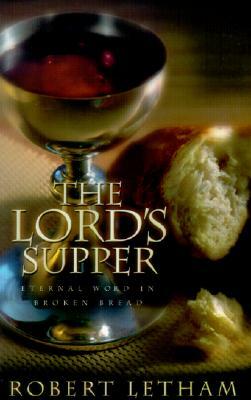 In Part Two, the author turns to a discussion of the Lord’s Supper in the history of the Church. Rather than taking a strictly chronological approach, he discusses the issue topically. He first examines the history of the doctrine of transubstantiation (the Roman Catholic doctrine) then follows this with a brief critique of the doctrine. He then turns to the Lutheran doctrine of consubstantiation and the Zwinglian memorialist views, offering helpful criticisms of some key points of weakness. The chapter is concluded with a summary of the Calvinist view and an explanation of the similarities and differences between it and the other views already examined. The Calvinistic doctrine is only introduced here because a more detailed presentation is offered in Part Three. Letham limits himself to a discussion of the Reformed doctrine as it is presented by Calvin and by the Westminster Confession of Faith. Part Four is devoted to a discussion of practical issues related to the Lord’s Supper. The bulk of this section deals with issues that are currently disputed in Presbyterian and Reformed churches. Letham begins with a brief discussion of the relationship between the Word and the Sacrament and then turns to a discussion of the elements, the recipients, and the frequency of the Supper. Regarding the elements, Letham argues for the use of a single loaf (to be broken during the sacrament) and a single cup (cf. 1 Cor. 10:17). According to Letham, the use of pre-cut bite-size pieces of bread and small individual cups changes what is being communicated in the sacrament. Instead of communicating that all the faithful share in the one broken body of Christ, what is communicated is post-Enlightenment individualism. Letham also points out that until the rise of the militant and legalistic temperance movement in nineteenth-century America, the use of wine in the Supper was the consistent and universal practice of the entire Church. It was used by Protestants, Roman Catholics, and the Eastern Orthodox. Among Protestants, it was used without any qualms by Baptists, Presbyterians, and Episcopalians alike. Letham observes that, in the United States, a large segment of the Church allowed the unscriptural aversion to wine that was being preached by the temperance movement to intrude into the Church and introduce an unheard of novelty into a central element of her worship. Letham is to be commended for beginning to fill a huge gap in current Reformed literature. He has offered a concise and very helpful introduction to the Reformed doctrine of the Lord’s Supper. While the book is by no means intended to be exhaustive, Letham does touch on most of the key issues of concern to Reformed believers today. He does so in an irenic and fair manner. One only wishes that the book were longer. At 75 pages, Letham can only cover each topic in the most summary manner. For the most part, this brevity does not cause any serious problems, but it does limit the effectiveness of his arguments on more controversial topics such as paedo-communion, the use of wine, and the frequency of observance. Because of the “hot-button” nature of these topics, it would have been very helpful to have seen a more complete statement of the different arguments. None of this is meant, however, to detract from the value of the book. The book is intended to be an introductory guide, not an exhaustive theological treatise, and as such it succeeds. This book provides a great starting point for a study of the Lord’s Supper and should be in the library of every church and every student of Reformed theology.